Hong Kong University Law Professor Albert Chen Hung-yee won the "Li Buyun Law Award"
[Ta Kung Pao News] Reporter Fang Junming reports from Guangzhou: The 6th "Li Buyun Law Award" award ceremony was held at Guangdong University of Finance and Economics on 8 December 2018. 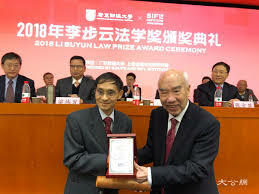 Harvard University professor William P. Alford and Hong Kong University law professor Albert Chen Hung-yee won the award. This is the first time a Hong Kong legal scholar has won the award. The jury believed that William P. Alford and Albert Chen Hung-yee have contributed to the rule of law construction and played an important role in promoting the rule of law exchange between China and the world. Albert Chen Hung-yee has been teaching at the Law School of the University of Hong Kong for a long time. His book Introduction to the Legal System of the People's Republic of China published in English in 1992 has become a textbook or reference book for the study of Chinese legal system in many English-speaking countries. He is also the Hong Kong scholar with the most contacts and exchanges between legal scholars in the two places. He has been to the Mainland for academic exchanges and speeches for nearly 30 years and has also invited mainland legal scholars for exchange in Hong Kong. Albert Chen Hung-yee said: "Prof. Li Buyun said in his interview that he has done two things in his life. One is to advocate the rule of law, and the other is to advocate the protection of human rights and set an example for my younger generation." During the award ceremony, Albert Chen Hung-yee was also appointed a visiting professor at Guangdong University of Finance and Economics along with nine other professors.